First of all, the basic principle underlying a high-performance KVM over IP is to authorise multiple users to remotely control servers located centrally in a dedicated room (server room or data center). Furthermore, access is secured using a keyboard, screen and mouse. All this takes place via the Ethernet network from different buildings within the company and even across distances of thousands of kilometers! In fact, this solution will help to increase your efficiency and reduce your costs. In addition, it is non-intrusive, that is to say you don’t need to insert cards or install software in the servers that host your critical applications. In fact, Raritan’s KVM over IP is now in its third version, KX III. It hosts up to 8 IP users simultaneously (models 1-2-4-8 + 1 local) at a maximum of 64 servers (models 1-8-16-32-64). Besides, you access the machines connected to the KX IP KVM via an Internet browser installed on the user’s PC. Also, if you want an easy way to manage multiple KX III, integrate them using Raritan’s CommandCenter Secure Gateway. 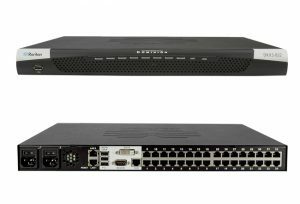 Moreover, two KX models are non-blocking: the KX3-808 and the KX2-101. The latter is a small KVM over IP that connects to a single server via a VGA port. These two versions are therefore considered to be non-blocking because the number of users is equal to the number of machines connected to the KVM. If you want, for example, to access more servers, simply add a KX. VGA, DVI, HDMI and DisplayPort. Various dongles for the connection of virtual media. Reboot the server via a Raritan iPDU. 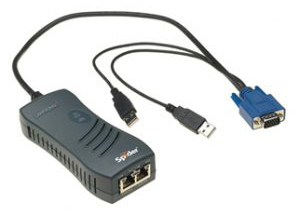 This small KVM over Ethernet from Lantronix is similar to Raritan’s KX2-101. It is the most economical solution if you have to manage IT equipment in different remote locations. It also makes it possible to manage the power supply via an optional PDU (1 door). Unlike the Raritan KX, the AdderLink Infinity does not require the user to possess a computer. In addition, the servers can be distributed across several different locations and the images can be sent to any screen without a mouse or keyboard. The system functions using transmitters (server side) and receivers (user side). You then connect to them 1 or 2 screens using a keyboard and mouse. This KVM over IP switch can function in “point-to-point” mode. That is to say that a receiver connects to a single transmitter over the network. What is more, thanks to the AIM (management platform), you access any transmitter on the network and share the images at all the destinations you choose. Your remote servers remain easily accessible! Finally, users’ environment, workspace and ergonomics are optimised without them having to change their working habits. They access their applications either via a browser or via a receiver unit to which the screen(s), keyboard and mouse are connected.